In the wake of last week's Capitol Press Conference -- calling on Legislative Committee Chairs and Leaders to allow public hearings on redistricting reform legislation -- legislative and public support for the measures --Senate Bill 163/Assembly Bill 185 -- continues to grow. 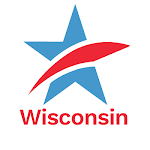 Two state legislators signed on as new co-sponsors of the measures and Common Cause in Wisconsin (CC/WI) members and other concerned citizens report numerous messages and calls to their own legislators as well as to State Senator Mary Lazich (R-New Berlin), State Representative Tyler August (R-Lake Geneva) -- the chairs of the committees with jurisdiction over redistricting reform, and to State Senator Scott Fitzgerald (R-Juneau) and Assembly Speaker Robin Vos (R-Rochester) -- who ultimately control the decision as to whether or not they will "allow" Lazich and August to hold public hearings. For the current list of co-sponsors of SB 163/AB 185 go here. We are working to add more co-sponsors. Wisconsin's newspapers continue to keep the pressure on for public hearings. This past Sunday, this Kenosha News editorial cited CC/WI's role in keeping redistricting reform front and center. Likewise, this Milwaukee Journal Sentinel editorial lauded the press conference of last week with State Senators Dale Schultz (R-Richland Center) and Tim Cullen (D-Janesville) with current CC/WI State Governing Board Members and former Republican politicians Bill Kraus and Dave Martin in support of this reform. 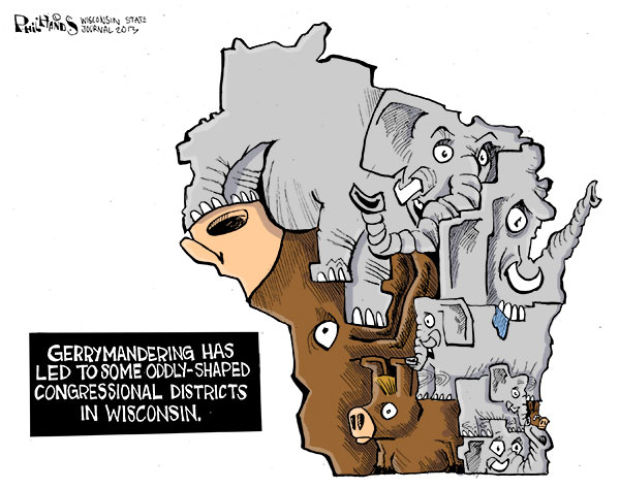 The Wisconsin State Journal editorialized about the need for public hearings on redistricting reform with excerpts from other Wisconsin newspapers calling for those hearings last month. Lazich, August, Fitzgerald and Vos have all publicly voiced their opposition to non-partisan redistricting reform. They strongly embrace the corrupted status quo that costs Wisconsin taxpayers millions of their tax dollars to draw non-competitive state legislative and congressional district boundaries in a hyper-partisan, secretive manner with no public input and no accountability. They can arrogantly ignore public opinion because all four of these legislators occupy gerrymandered, utterly safe Republican districts and will never have to worry about being defeated in a general election. 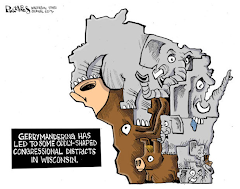 And as a result of gerrymandering, none of those four legislators feel that they need to explain to the citizens of Wisconsin why they won't even allow a public hearing on redistricting reform. As numerous newspapers have editorialized over the past month: What are Lazich, August, Fitzgerald and Vos afraid of? Remember those names: Lazich, August, Fitzgerald & Vos. It should be easy to do so. It sounds like the name of some hyper-partisan law firm that might engage in secretive gerrymandering with millions of taxpayer dollars. In 2011, Michael, Best & Friedrich, a Madison law firm, was awarded the gerrymandering bonanza. But who knows what may be in store for Wisconsin in 2021? 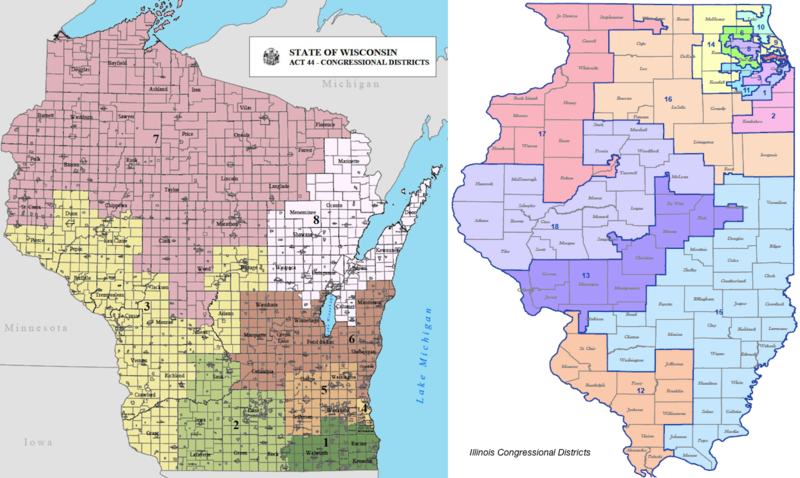 As a result of the gerrymandering that occurred in 2011, the 5th State Senate District of Wisconsin was changed from a very competitive district between the political parties into a safe Republican district. Parts of the Democratic-leaning City of Milwaukee were taken out of the district and much more Republican territory in Waukesha County was added to benefit the current incumbent, State Senator Leah Vukmir (R-Wauwatosa). Now that she no longer has to worry about re-election and therefore being responsive and accountable to the voters of her district, Vukmir can do things like decide she does not have to abide by Wisconsin's long-established Open Records Laws. For more on this astonishing, recent action go here and here. Here's our question: If Vukmir still occupied a competitive state senate seat and had to be accountable and responsive to all of her constituents, would she have made the decision to exempt herself from the same law every Wisconsin citizen -- and until now, every Wisconsin legislator -- had to obey? We dare you to answer that question in the affirmative without bursting out in laughter. Now, are you with us? Tuesday's Capitol Press Conference received blanket media coverage and the participants resolved to keep fighting to get redistricting reform legislation (Senate Bill 163/Assembly Bill 185) at least a public hearing -- even in the face of seemingly intractable opposition to the legislation by State Senate Majority Leader Scott Fitzgerald (R-Juneau) and by Assembly Speaker Robin Voss (R-Rochester). No one expects Fitzgerald or Vos to change their minds (although they should) and support redistricting reform any time soon. But to block even a public hearing on the legislation -- so that the citizens of Wisconsin can hear all sides of this important issue -- is just arrogance -- and certainly not in keeping with the rich tradition of open, accountable state government that Wisconsin was for a long time (but no longer) known for and revered nationally. That arrogance is, as one of the participants said, at the very heart of the reason why redistricting reform is so needed in Wisconsin. State Senators Dale Schultz (R-Richland Center) and Tim Cullen (D-Janesville) were joined by Common Cause in Wisconsin Board Chair Bill Kraus, a former Republican strategist and top aide to former Republican Governor Lee Sherman Dreyfus, and long-time CC/WI Board Member Dave Martin, a former Republican State Representative from Neenah and the Republican candidate for Lieutenant Governor in 1970. Also on hand at the press conference were blown up maps of the congressional and state legislative districts of Wisconsin, Illinois and Iowa to demonstrate the contrast between the gerrymandered, hyper-partisan boundary lines of districts drawn by majority Republicans in Wisconsin and majority Democrats in Illinois contrasted with those maps drawn by the non-partisan Legislative Services Agency in Iowa. Wisconsin and Illinois featured oddly shaped, contorted districts with long slivers and the division of counties and even towns and villages in order to achieve maximum partisan political advantage for the partisan map drawers. 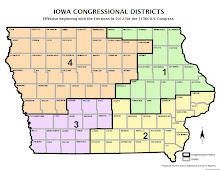 The Iowa maps contain mainly squares and rectangles with communities of interest and counties by and large kept intact. They are drawn with no consideration given to partisan advantage and with a goal of making sense to the citizens of Iowa by keeping communities together when at all possible. Contrast that with Wisconsin where, for example, the relatively small city of Beloit has been carved up among two Assembly districts as has Sheboygan. The result is that in Iowa there are far more competitive general elections for the State Legislature and for Congress in Iowa than there are in Wisconsin -- despite being half our size. 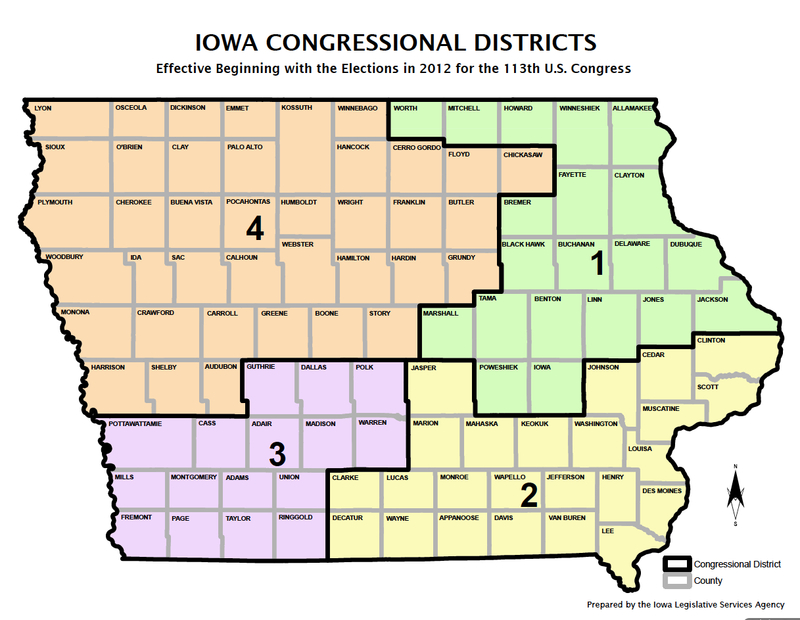 In fact there are zero competitive congressional districts of Wisconsin's eight. Half of Iowa's four are quite competitive. The cost to taxpayers for non-partisan districts is negligible. In Wisconsin, taxpayers have been forced to shell out about $2 million for hyper-partisan, non-competitive congressional and state legislative redistricting. No one checked with us to see if that was okay. How about with you? It is well worth your time to view Tuesday's entire Capitol press conference here on WisconsinEye. Additional television coverage is here. Wisconsin Public Radio's coverage of the event is here and the Wisconsin Radio Network's coverage is here. Other media coverage is here. Here is the pathetic statement that Scott Fitzgerald put out within an hour of the press conference on Tuesday. His aides attended the event but obviously don't understand what the redistricting reform legislation contains because their criticism is about things that are not even part of the legislation. That's just sad. 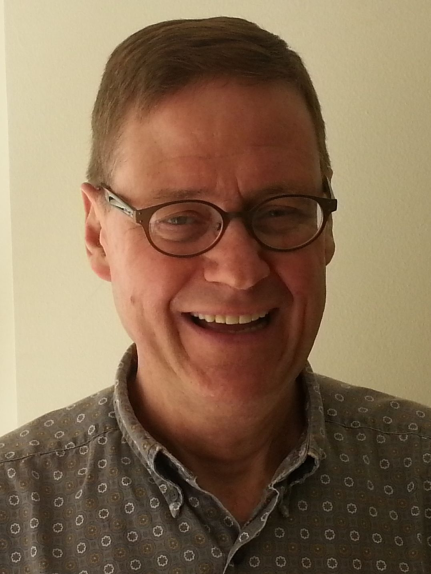 After the press conference, CC/WI Director Jay Heck spent a half-hour on statewide Wisconsin Public Radio talking about redistricting reform and you can hear that here (interview starts at 34:17). As CC/WI Board Chair Bill Kraus would say: "Are you mad yet?" Mad that the legislative leadership won't even allow a public hearing on redistricting reform legislation but won't say why? That is maddening. Contact Scott Fitzgerald and Robin Vos and let them know that you are "mad as hell and you are not going to take it anymore." A public hearing is not too much to ask for. It is the very least they should do. Again, as the Appleton Post-Crescent said in their excellent editorial about this subject in August: ". . . we're not going away. Redistricting reform is not going to be swept under the rug." This has become our mantra. Make it yours too. Wisconsin State Senators Dale Schultz and Tim Cullen are joined by Common Cause in Wisconsin State Governing Board members Bill Kraus and Dave Martin to visually demonstrate why Wisconsin (and for that matter, Illinois) ought to look to Iowa to adopt a more sensible, non-partisan, less expensive and greatly improved redistricting process now, so that it will be in place for the 2021 redistricting process following the 2020 Census. Does Your State Senator or State Representative Oppose Non-Partisan Redistricting Reform? 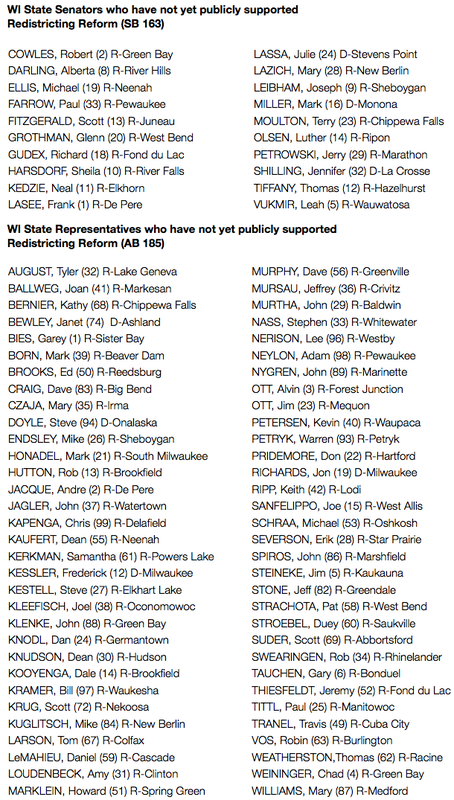 The Wisconsin Legislature comes back into session this month (for three days) but not a peep yet from State Senator Mary Lazich (R-New Berlin) or State Representative Tyler August (R-Lake Geneva) on when the legislative committees they chair will hold public hearings on non-partisan redistricting reform legislation -- Senate Bill 163 and Assembly Bill 185 (which are identical). Despite the fact that every major newspaper editorial board in Wisconsin and hundreds of Wisconsin citizens have called for hearings on this needed, common-sense legislation, Lazich and August remain unresponsive. Lazich has public hearings scheduled for this morning on five minor and largely unnecessary, partisan election-related measures that no one has clamored for, and on a misguided measure -- Senate Bill 268 -- that attempts to inject more partisanship into the non-partisan Government Accountability Board by doubling the number of candidates from which the Governor can choose so that he (or she) can have a better opportunity to select G.A.B. members more to his or her "liking." No one, other than the few disgruntled legislators who want the G.A.B. to be less independent and more responsive to their partisan concerns, thinks this is a good idea. It's not. Note to legislators: If you support SB163/AB185, but your name is listed above, contact us and we will make sure you are listed as a supporter of redistricting reform. If your State Senator and/or State Representative are listed above, please contact them immediately -- and implore them to co-sponsor SB 163/AB 185 and to support non-partisan redistricting reform. Urge them to tell Sen. Lazich and Rep. August to hold public hearings on the legislation even if those committee chairs don't support it. This isn't Russia or China after all. This is Wisconsin, where all opinions deserve at least a public hearing -- and used to get at least that. To contact your State Senator and State Representative, go here. If you are not sure who your State Representative and/or your State Senator are, go here. We have been telling you all Summer we are not going away and we are going to continue to advance redistricting reform. If you have not done so already -- or even if you have -- please make your voice heard on this vital issue!